A tree's bounteous display of white spring flowers announces to the world that indeed, wintertime is over. Display their joyous celebration in a number of ways. Use them as accent plants, to shine against a dark fence or wall, to bring up close and personal into a patio or as a street tree. Group several trees of the same kind in a mass planting for a strong visual statement. 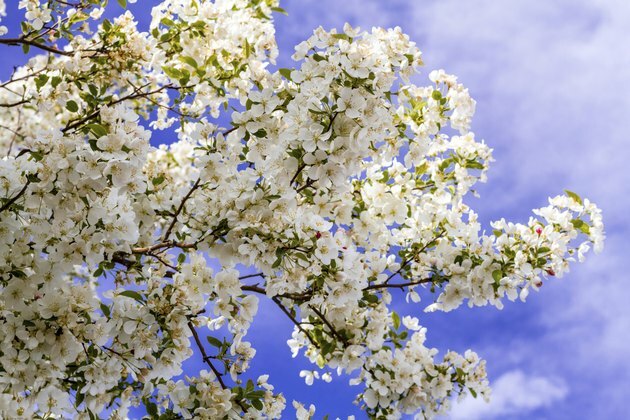 Some white-flowered spring-blooming trees are large enough for shade tree use. There are advantages to using native species. They're adapted, there's little chance of them becoming pest plants, and they're more unusual than commonly available introduced species of trees. A tree suitable for much of the U.S. because it spans U.S. Department of Agriculture plant hardiness zones 4b through 9a, white Eastern redbud (Cercis canadensis var. alba) grows 20 to 30 feet tall and 15 to 25 feet wide. Before the leaves emerge, clusters of white sweet-pea-shaped flowers cloak the branches. For more arid areas, consider "Texas White" (Cercis canadensis var. texensis), with the same hardiness zone requirements. Another native tree also suited to more arid areas is holly-leaf cherry (Prunus ilicifolia), native to Southern California. Abundant cream to white spring bloom is followed by red, edible fruits. The evergreen tree has glossy, dark green leaves and is hardy in USDA zones 9 and 10. For pure dramatic effect, a weeping tree in the landscape steals the show. Weeping Higan cherry "Snow Fountains" (Prunus "Snofozam" "Snow Fountains") is a small tree, rising 8 to 15 feet tall and 6 to 8 feet wide, and is hardy in USDA zones 5 through 8. The long, hanging branches sweep to the ground, providing a waterfall of fragrant flowers in early spring. Somewhat taller and wider, "Red Jade" weeping crabapple (Malus "Red Jade") is 12 feet high and 20 feet wide. 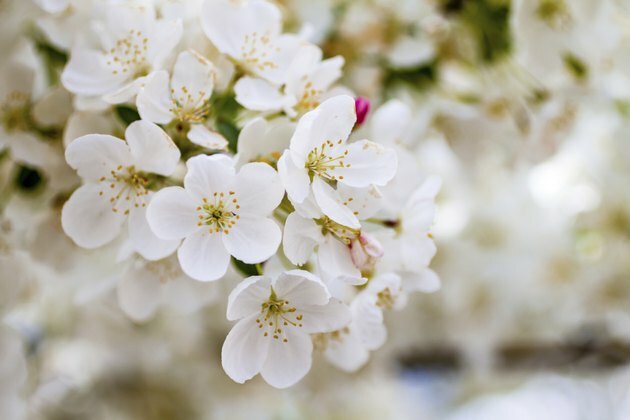 Profuse white spring flowers produce bright red fruit in fall and winter that birds enjoy. 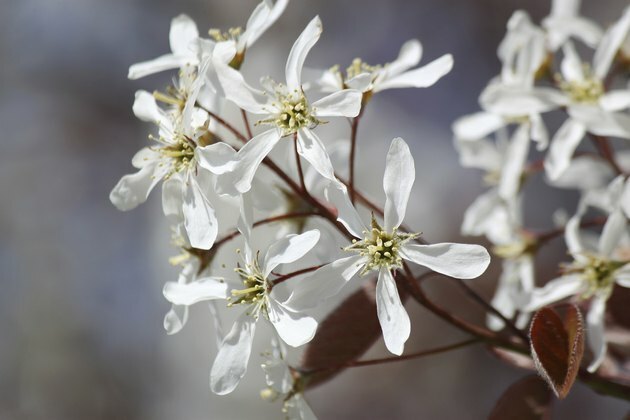 Extend seasonal interest when you choose white-flowered trees that produce color in the fall as well. 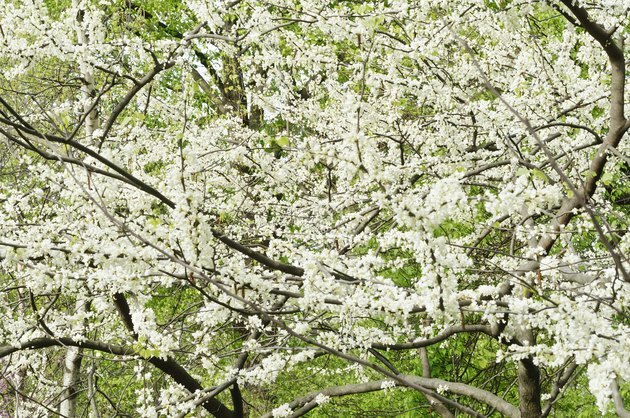 An example is apple serviceberry (Amelanchier x grandiflora), a hybrid between two naturally occurring species of serviceberry. Blooming in early spring before the leaves fully emerge, the tree eventually reaches 15 to 25 feet tall and almost as wide. Hardy in USDA zones 4 through 9, apple serviceberry offers edible blueberry-like fruits in fall as well as vivid purple, orange and red leaves. Another native, flowering dogwood (Cornus florida) has red fall foliage and colorful fall fruits. The showy white bracts that look like petals give a long-lasting spring show. Flowering dogwood is hardy in USDA zones 5 through 8 and grows to 20 feet tall and 15 feet wide. With a different blooming habit from most other spring-blooming trees, trees with flowers that hang down from the branches give an unusual blooming effect. Consider Carolina silverbell (Halesia tetraptera), hardy to USDA zones 5 through 8. White, bell-shaped flowers hang from tree branches in mid- to late spring. In cultivation, it grows 20 to 40 feet tall and 15 to 30 feet wide. Japanese styrax (Styrax japonicus) has more open, bell-shaped, fragrant white flowers, growing 20 to 30 feet tall and wide in USDA zones 5 through 9. 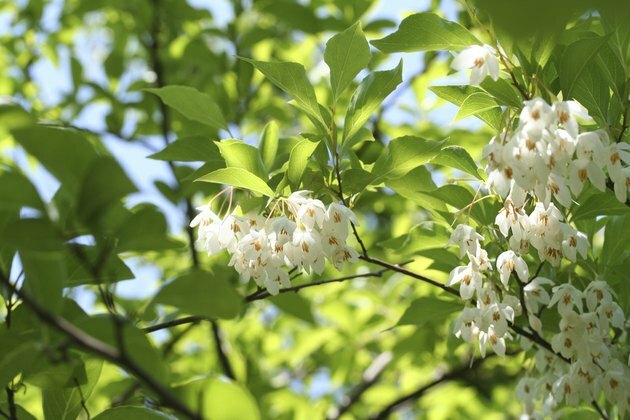 Native to Korea, China and Japan, Japanese styrax is related to Carolina silverbell.